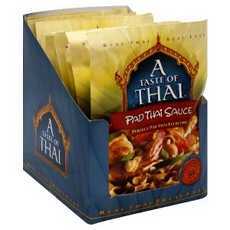 Enjoy A Taste Of Thai Pad Thai Sauce . Pad Thai Sauce Perfect Pad Thai Everytime. Real Thai, Real Easy. Authentic Thai Taste: The Most Famous Of All Thai Dishes, Pad Thai Is The Essence Of The Country's Cuisine. With Our Authentic Tangy, Sweet Sauce Made With Fresh Tamarind, You Can Choose Your Favorite Meat Or Fish, Plus Traditional Thai Vegetables, And You'Ll Have An Authentic Thai Classic. Preservative Free. Msg Free. Produced In Thailand. (Note: Description is informational only. Please refer to ingredients label on product prior to use and address any health questions to your Health Professional prior to use.